Every so often we wake up early on a Sunday morning absolutely starving! With the lazy mood we would be in, I wouldn’t even want to get out of my pj’s let alone head to the shop. Sundays are generally the day that we do a big shop, so in the morning there is basically very little in our fridge, just the remnants of the weeks vegetables. But we do usually have eggs. Eggs are the lifeline to most cakes, ice creams, tarts and sauces. And full of goodness. I’m not a huge egg lover. If it looks like an egg and smells like an egg, I generally don’t want to eat it. I do however love omelettes (or in this case more of a frittata). I’m fairly sure everyone knows how to throw together an omelette. 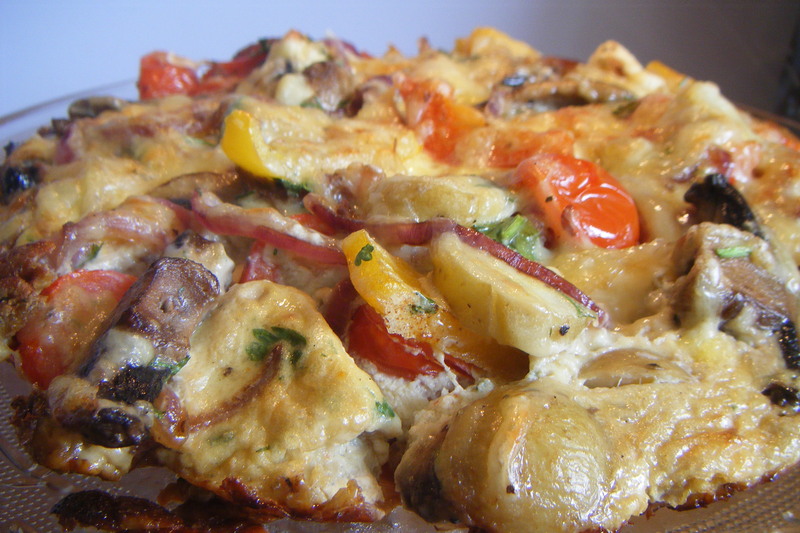 This little frittata isn’t much different from an omelette with regards to ingredients. It’s just a matter of different technique. Omelettes traditionally have the egg mixture cooked and folded around a filling, while a frittata just mixes it all up, cooked in a mishmash combination all at once. So on a lazy Sunday morning, I make my fritatta with everything thrown in, bar the kitchen sink! Remember you can use any vegetables and herbs you have in your fridge. This is just an example of what you can use. Preheat your oven to 180 °c (fan oven). In a heavy based frying pan or large heavy based 22cm saucepan (with oven proof handle), gently fry the onion just to soften slightly (2-3 minutes). 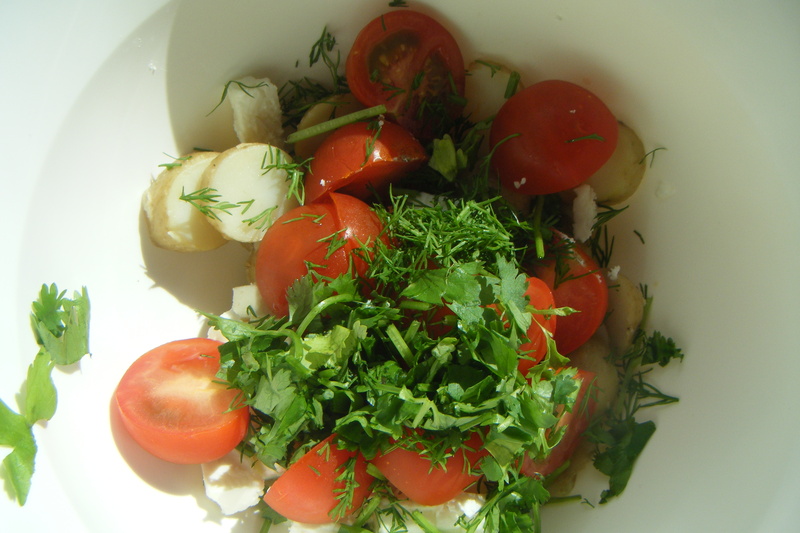 In a bowl, put your potatoes, tomatoes, feta and fresh herbs. Add the onions to the bowl. Gently fry the mushrooms and peppers (this can actually be done with the onions but I forgot… oopps) until soft and slightly browning. 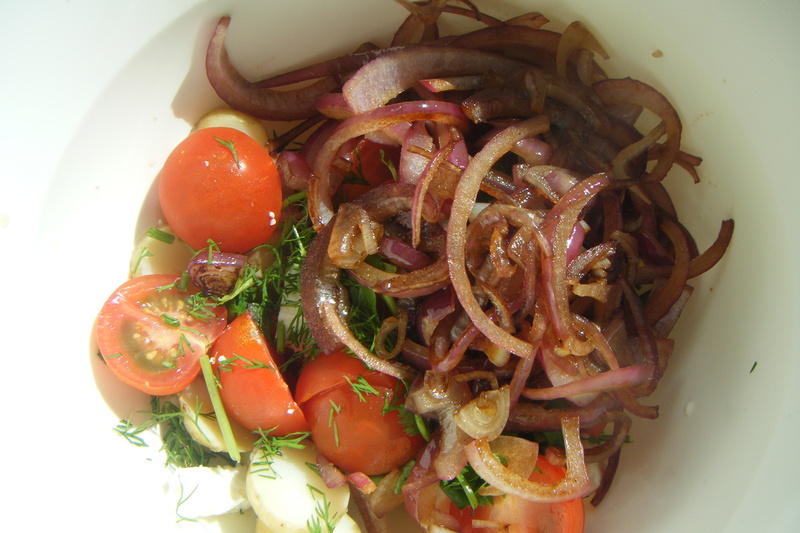 Add them to the bowl with the tomato and onion mix. In a jug or another bowl, beat the eggs, milk and seasoning. 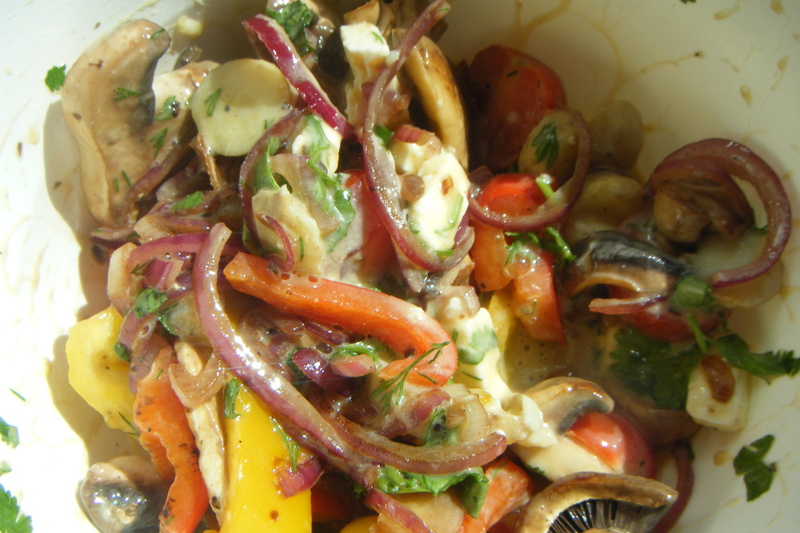 Pour this into the bowl with the veg and mix. 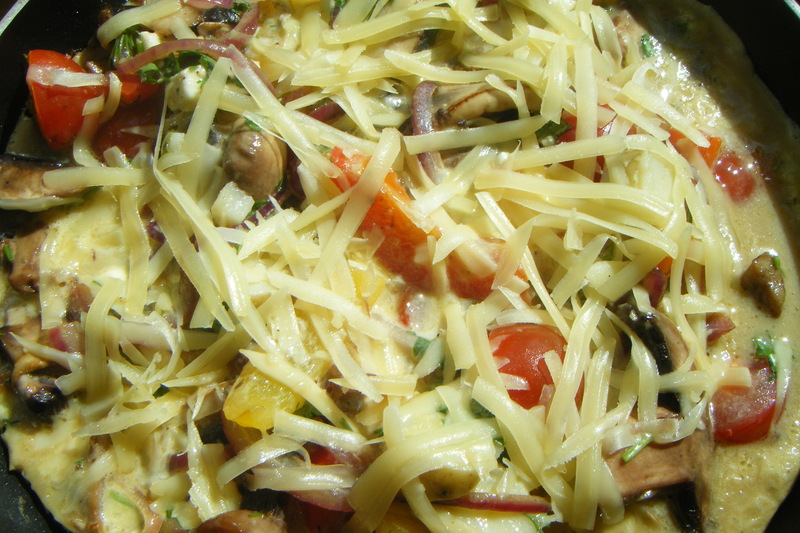 Pour the mix into the frying pan/saucepan and top with grated cheese. Cook for a few minutes (3-5) on a low heat on the hob. Bake for about 15 minutes in the oven or until set. It looks so yummy in the oven as it puffs up slightly and glistens from the melted cheese. Leave to cool for a few minutes before removing from the pan and cutting. Serve up with a green salad.